Traditionally, the only option (other than to replace all of the filters) was to manually inspect the filters to determine the source of the leak. But not all leaks are obvious to the naked eye. While some leaks may be caused by a catastrophic failure (e.g. ripped seam, dropped filter, etc.) many come from seemingly intact filters. To improve the process, the dye leak testing method was developed. 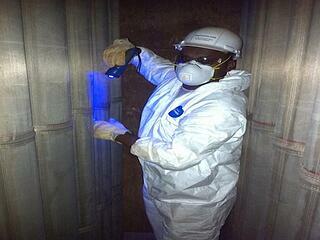 Dye leak testing is done by having a technician inject a fluorescent powder upstream of the baghouse. With the system running, the powder is pulled through the unit and dispersed evenly throughout the entire unit. This causes a larger buildup of the dye powder at the point of the leak. Afterwards, the unit would be shut down and a technician would enter and using a black light he could identify any leaks in the filters or tubesheet by looking for areas where more of the dye had built up (due to the air rushing to this one spot as following the path of least resistance). The black light enabled the powder to be clearly seen even at a distance, meaning the technician could inspect all of the bags and the tubesheet much quicker and more thoroughly than just a visual inspection. 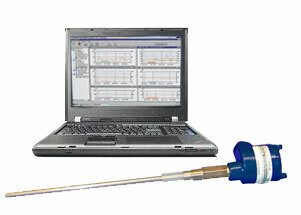 Triboelectric monitoring allows users to detect leaks by measuring the total emissions levels coming from the baghouse. When the readings rise, or spike, the monitor can either trigger a relay alarm to indicate that a failure has occurred, or it can display the emissions trending data in real time for operators to monitor. Further, the use of a detector on each compartment of a multicompartment dust collector rather than just one on the common outlet or main stack means that leaks can be isolated to a particular compartment of the system. On pulse jet baghouses that clean online, the emissions data can further narrow down the location of the leak to a particular row of filters. This narrows the scope from thousands of bags down to only a dozen or so - offering significant time savings and focusing baghouse leak testing efforts. Baghouse leak testing with dye continues to form a key part of regular preventative maintenance for dust collection systems. These tests are still necessary at certain times such as after a fresh install of a new set of bags/cages into a unit or when troubleshooting issues within the unit. Triboelectric leak detectors pick up at the crossover between maintenance and emissions. Tribo units provide early warning of impending leaks, alerting personnel at the very beginnings of leakage before it becomes a reportable event. This allows for resources to be spent as needed on leak detection and repair that normally would need to be spent on visual inspections and manual monitoring. Additionally, tribo units also cut maintenance time by pinpointing the leaking filter to a certain area. Looking for ways to cut your operating costs? Let Auburn Systems show you how our Tribo.dsp product line can help reduce your maintenance costs today. Contact us today to discuss your application. Want more info on intelligent dust monitoring? Download our free guide.